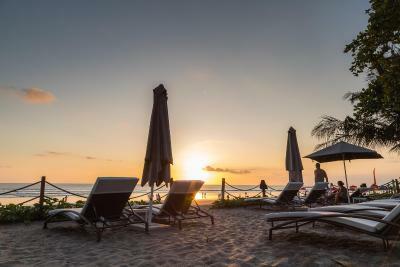 Lock in a great price for Double - Six, Luxury Hotel - Seminyak - rated 9 by recent guests. 5 stars! Beautiful hotel, lovely suite & staff Great facilities, I’m only sorry I only stayed on my last night before flying home. I would definitely go back. 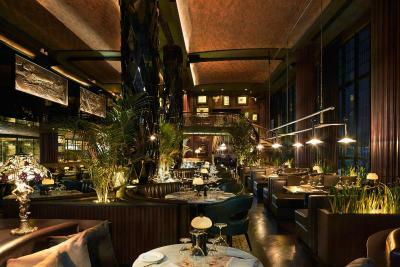 I had an excellent meal in the plantation restaurant. the staff are all attentive. service providing are great. definitely one of the best to stay at. Modern comfort is impossible with 18 degrees running aircondition, which is louder than anything else! Without aircon too big humidity's!! See all wet and dirty marks allover the house, smell of dirty aircon air! With closed windows impossible to sleep before 2 a.m. because of bands playing at seminiyak beach clubs. For young couples sure perfect, for children .. nope. Amazing service from attentive staff. Fantastic & clean amenities. The room is fantastic, the view is great, the services are OK, the breakfast a la carte is very good and with a lot of options. The customer service was exemplary. The entire property was very clean and well located. Excellent service! Excellent food! Ultimate resort for relaxation. Loved every minute. 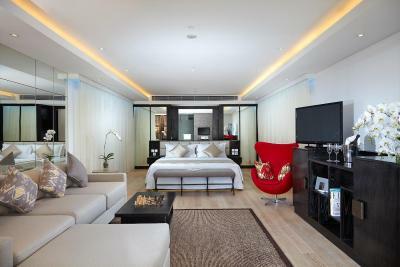 One of our top picks in Seminyak.Double - Six, Luxury Hotel - Seminyak enjoys great views of the Indian Ocean. 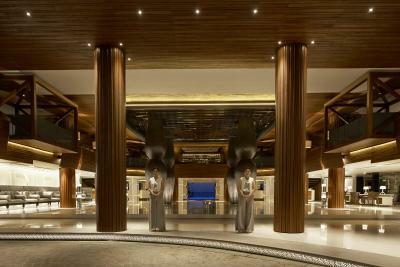 It boasts a spa centre and a variety of dining options. Free WiFi is available in all public areas. 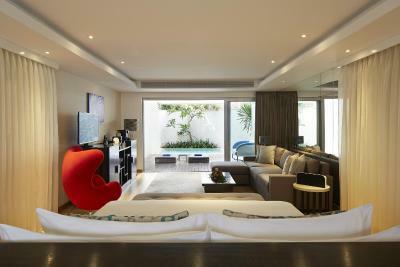 Air conditioned rooms at Double - Six, Luxury Hotel - Seminyak are furnished with sofa sets and feature large windows. They are fitted with a flat-screen cable TV. Espresso machine and tea making facilities are also provided. 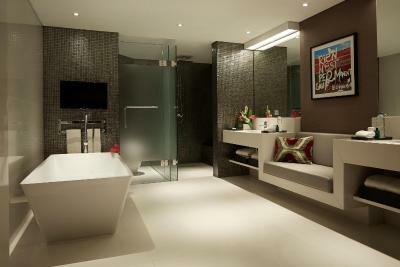 En suite bathroom is equipped with luxury amenities, bath tub and shower. Guests enjoy the convenience of 24-hour on call butler and room service. Guests can work out at the fitness center or enjoy a relaxing massage at the spa. 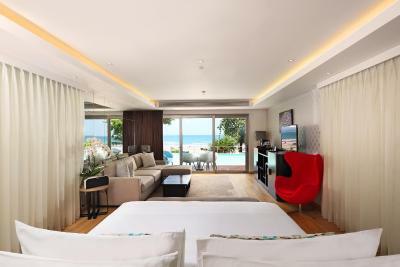 Double - Six, Luxury Hotel - Seminyak offers a 24-hour front desk and a concierge service which can assist in airport shuttle and currency exchange services. 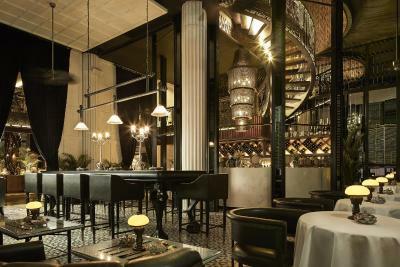 The property offers free parking as well as complimentary valet parking. Other facilities offered include laundry, evening entertainment and express as well as private check in - check out. 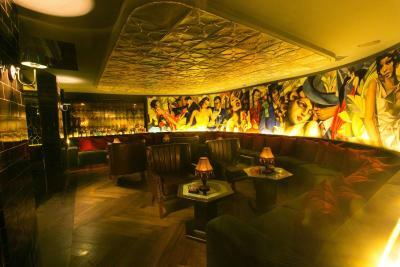 Double - Six, Luxury Hotel - Seminyak offers various restaurants and bars serving a fine selection of Italian and Western cuisine, while special diet menus can also be prepared upon request. 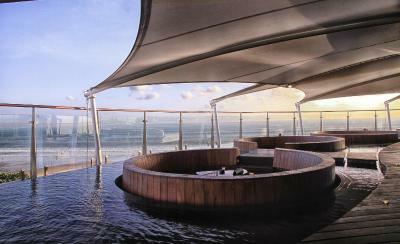 Ngurah Rai International Airport is 3.1 miles away from the property. 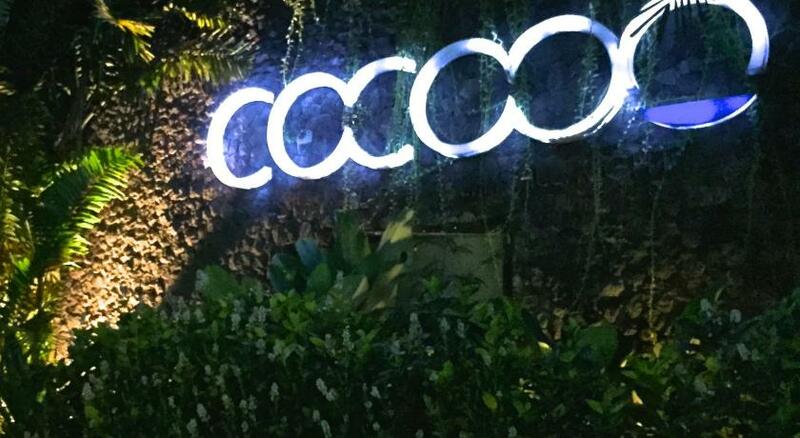 Double - Six, Luxury Hotel - Seminyak has been welcoming Booking.com guests since 29 Apr 2014. 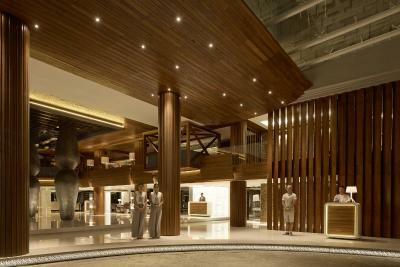 When would you like to stay at Double - Six, Luxury Hotel - Seminyak? 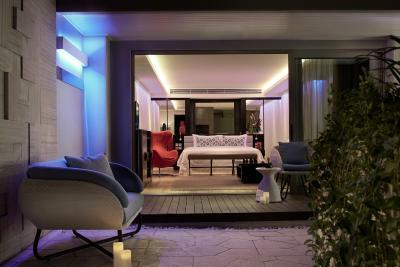 This spacious air-conditioned suite features its own plunge pool and seating area. Fitted with flat-screen cable TV. En suite bathroom comes with shower, bathtub and Hermes amenities. 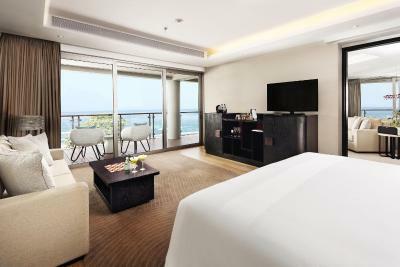 This spacious air-conditioned suite overlooking the Indian Ocean features a balcony, and seating area fitted with flat-screen cable TV. 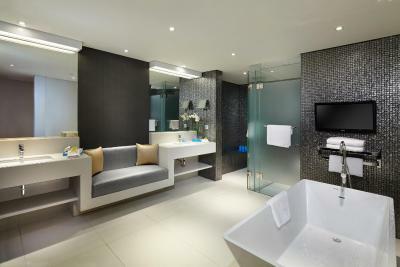 En suite bathroom comes with shower, bathtub and Hermes amenities. 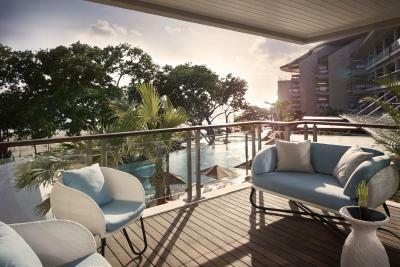 Offering sea views, this suite is located on the ground floor and provides access to the outdoor pool. 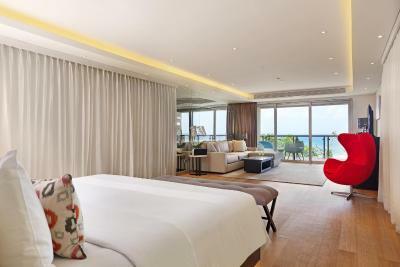 Offering ocean views with a personal balcony, this suite has a sofa. The two bedrooms are connected via a private entrance. 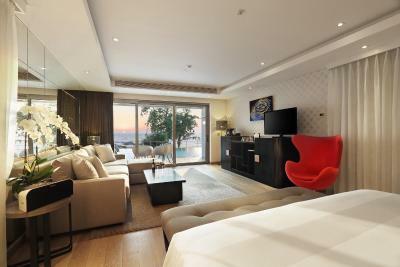 This air-conditioned suite has a balcony, a flat-screen TV and a safety deposit box. This duplex-style suite features 2 bedrooms with a shared balcony, a seating area and a kitchen. 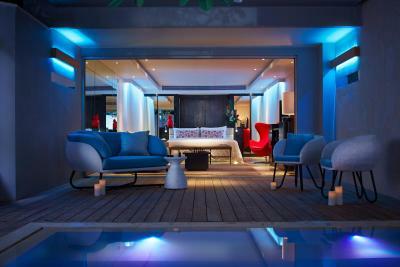 House rules Double - Six, Luxury Hotel - Seminyak takes special requests - add in the next step! Double - Six, Luxury Hotel - Seminyak accepts these cards and reserves the right to temporarily hold an amount prior to arrival. Please note that the credit card used for the reservation must be valid throughout the entire stay and must be presented during check-in for validation process along with photo ID and/or valid passport. Otherwise payment will be collected upon arrival. If booking is made on behalf of someone else, guest must contact the hotel directly for payment arrangement. Please note that extra bed in the room is a sofa bed with a mattress. Any additional guests aged 7 years and above are required to use the sofa bed and will be charged accordingly. Please contact the hotel directly for more information on the charges. There 2 beach bars in front of the hotel that both had “competing” live musicians in the evening. It was a bit tough sitting on the balcony listening to them both (a minor 1st world problem in the grand scheme of things!). No garden. The beach is over a road with a lot of motorcycle, and the private beach is very small and fix near the road. Big waves in the ocean. My room with the ocean view, wasn't the best one😩. An expensive hotel. 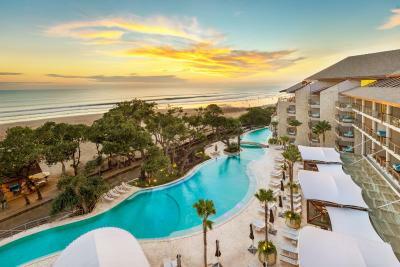 We experienced two struggles: The location is extremely close to numerous beach parties that play loud music until midnight; if relaxation is what you’re looking for this hotel won’t work for you. Additionally, the sales staff assisting the guests were quite cold and unhelpful. The hotel was nice. The breakfast was good. The concierge was also extremely helpful.